Today I witnessed a touching picture of love. Noah is 7, and his little brother, Jaxten is 3. 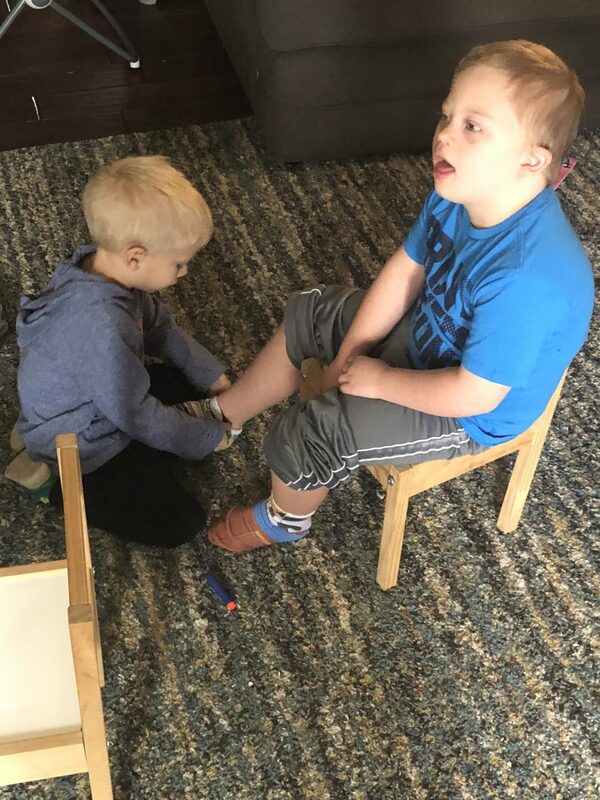 Normally the bigger brother would be helping the younger, but not in these pictures. You see, for Noah certain tasks that are easy for others, aren’t so easy for him. Putting on his own socks is one of those tasks. He struggles with the fine motor skills required to put on his own socks. 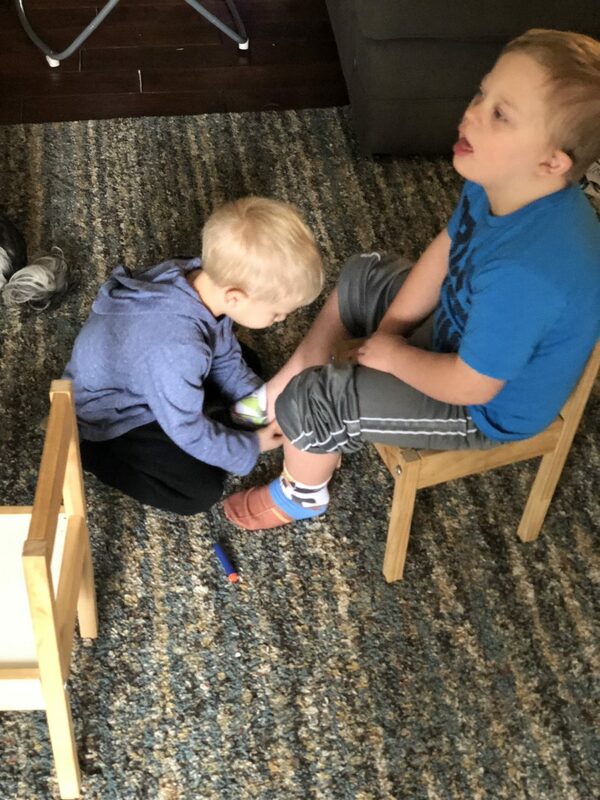 As we were getting ready to leave our house this morning, I asked Noah’s 3 year old brother to help Noah get his socks on, and this is what I saw. What an awesome picture of Biblical servanthood (read: real love.) 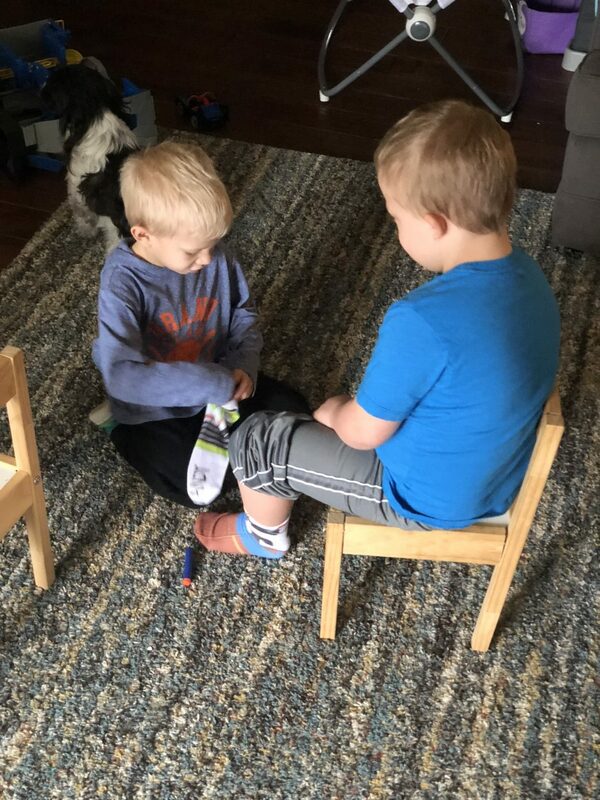 Seeing our 3 year old son get down on the floor and put socks on his older brothers feet. 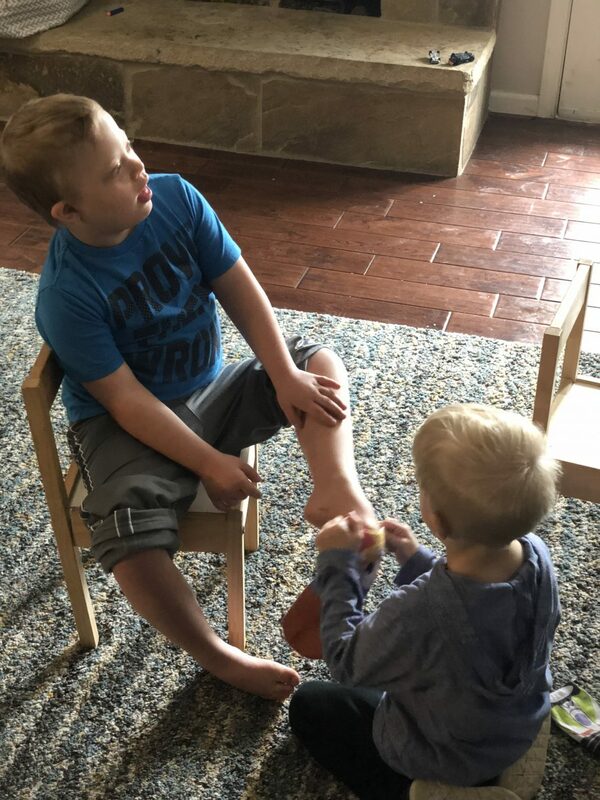 Jaxten is so kind to Noah. My hope is as the boys get older, Noah’s two brothers will continue to love, serve, and help him. Jaxten, Noah may not be able to tell you how much he appreciates and loves you, and I’m sure you can’t understand at 3 how much we do, but we do. We love you so much buddy, and are so thankful you are in all of our lives. If you’re a parent of a newborn child with Down syndrome you may have mixed feelings about this post. 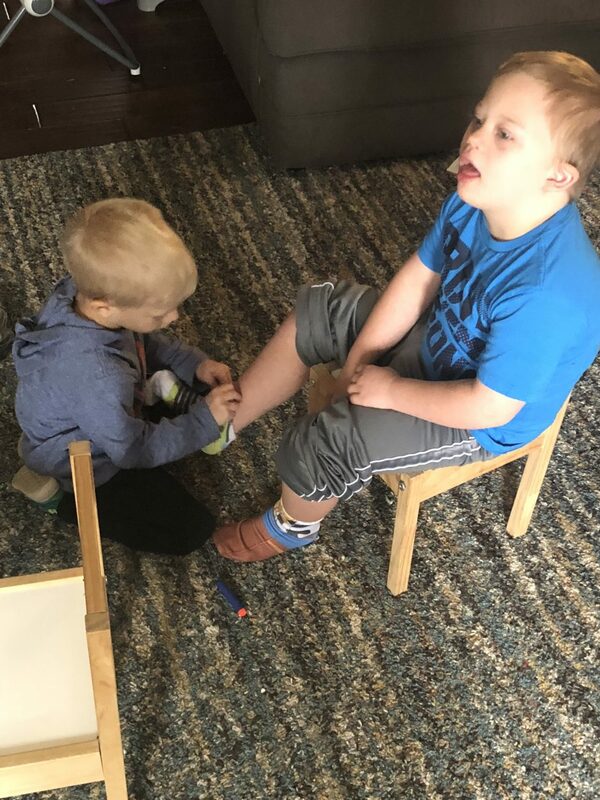 On one hand you’re encouraged by a sweet story about two brothers, but on the other hand you may be discouraged that our son with Down syndrome is 7 and has a hard time putting his socks on. I get it. By this time, you’d expect that a 7 year old could put his socks on, and you may be discouraged that our son can’t. But that’s life. We all do well in some areas, and need a little help in others. For Noah, putting on his socks it a little tough. But he does really well in other things…like snow tubing, riding roller coasters, and skiing (ok, he may not really well with snow skiing, but he tried.) When Noah was young I think I would have been discouraged by a post like this. I would want my son to be able to put his socks on 100%, every time, without help, by 7. But the older I (and Noah) get, the more I understand that every child really is unique. They will excel at some things, and need a little help with others. It’s all good. The important thing is that we all (adults included) have people in our life to help us “put our socks on” so to speak. For those of you that have a child with Down syndrome, and other children, do the typical children help out the child with Down syndrome? Share your stories in the comments below! Awesome! It sounds like you guys have a great family. Beautiful. I have two grandsons. Phenizie and Peyton. 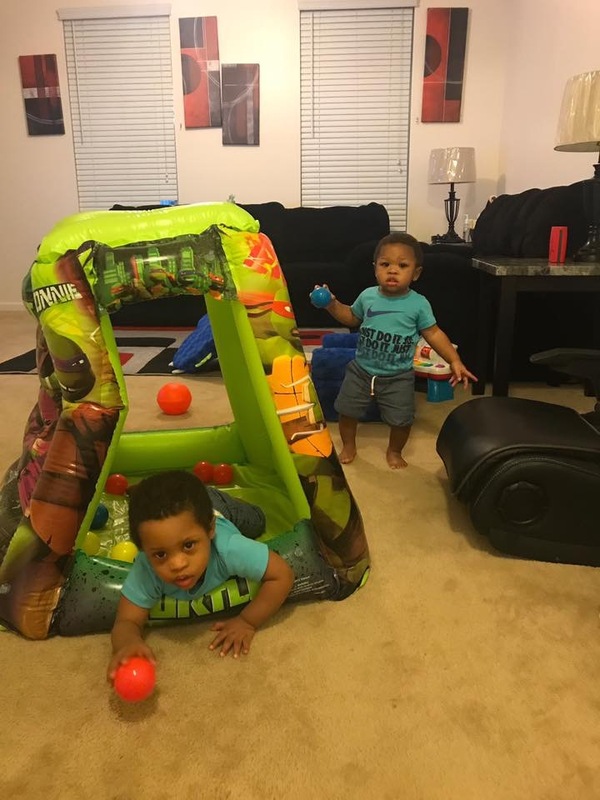 Phenizie is 2 yrs 6 months and Peyton is 16 months. Phenizie has Down’s syndrome. When my daughter in law was pregnant with Peyton, I had mixed emotions. I felt it was to early, not knowing the challenges of raising a child with Down’s syndrome. But God makes no mistakes. Peyton will be Zie’s(Phenizie) help mate. Thank you for sharing. Thanks for your comment, and sharing the picture and telling us a bit about your family! Please keep us posted on your family’s story! Rick, As the grandmother of a child with DS I have been very depressed lately. I just had someone tell me the other day that it is a waste of time and money for my grandchild to have therapy. I am still upset by his comments. I am encouraged by your posts about Noah. I hope my grandchild can grow up to attend school and make friends. It was a complete shock when he was born. Now he is 3 years old and behind in several milestones. With time and therapy he will catch up. I printed out your 10 Things to Never Say. I have had people say many of those things to me. It hurts! A lot! Thank you for sharing that priceless picture! Jaxten is a loving brother because he’s learned how to be loving from the example you and your wife set in your everyday lives. 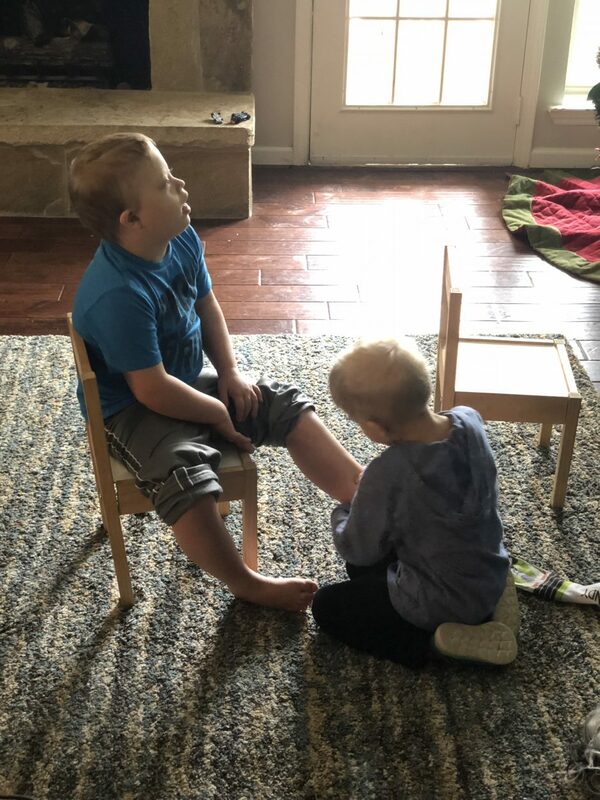 My 4 year-old granddaughter has D.S., but she’s blessed with a 6 year-old brother who loves her and watches out for her in so many ways. May God continue to bless you and your family! Thanks for the comment, and for the kind words. By God’s grace, I hope they learn how to love others from their mother and I. You sound like a loving grandmother yourself! Happy New Year. 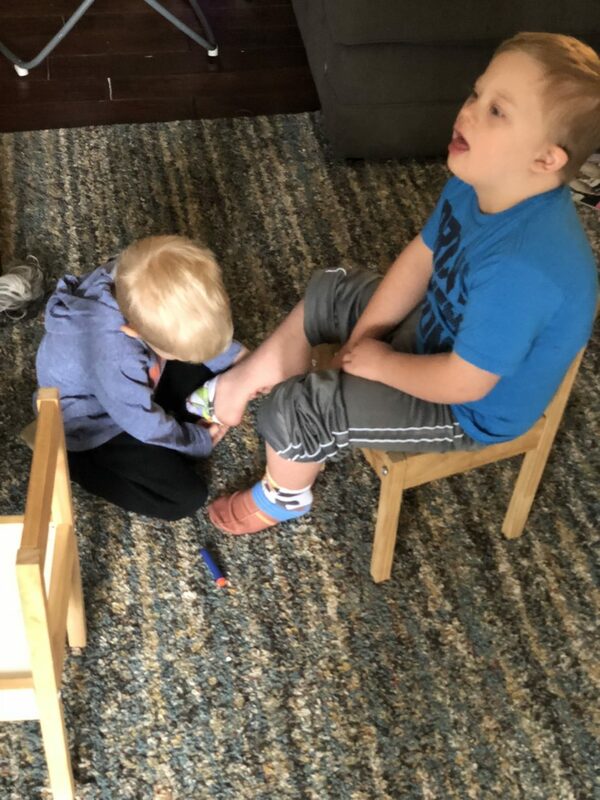 at age 7 some kids with DS can put their socks on some can’t..all kids are different and uniqe but also some kids without any diagnosys can’t do some easy things..cause they are lazy or they expect we do things for them..
brotherly love is so preciouse.. It brings tears of joy to my eyes when I watch our grandkids (4 and 6) helping our daughter (almost 30) with the daily living skills she has trouble with! 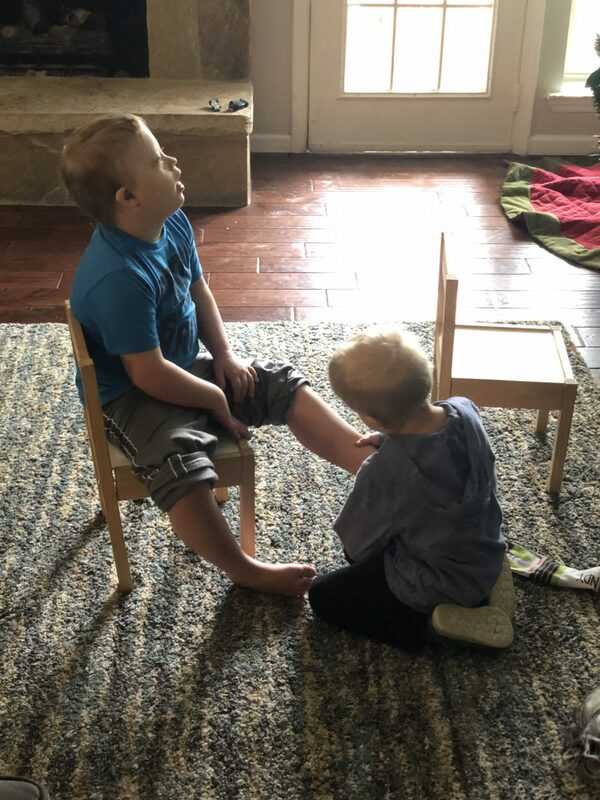 They have been raised in a household that is loving, accepting and respectful of all people, each with their own unique set of skills and needs. Their Mom is our other daughter (a pediatric Occupational Therapist – I wonder how she decided to be one of those?! 🙂 ) and is married to a wonderful guy who is just as accepting, loving and understanding. Life is good. God is good! Thanks for sharing your story with us.